The equations of classical physics do not require the arrow of time to flow only forward. However, observation indicates this is what always happens. So tomorrow’s predicted warming that has not happened today cannot have caused yesterday’s superstorms, now, can it? That means They can’t even get away with claiming that tropical storm Sandy and other recent extreme-weather happenings were All Our Fault. After more than a decade and a half without any global warming at all, one does not need to be a climate scientist to know that global warming cannot have been to blame. Or, rather, one needs not to be a climate scientist. The wearisomely elaborate choreography of these yearly galah sessions has followed its usual course this time, with a spate of suspiciously-timed reports in the once-mainstream media solemnly recording that “Scientists Say” their predictions of doom are worse than ever. But the reports are no longer front-page news. The people have tuned out. The Intergovernmental Panel on Climate Change (IPeCaC), the grim, supranational bureaucracy that makes up turgid, multi-thousand-page climate assessments every five years, has not even been invited to Doha. Oversight or calculated insult? It’s your call. IPeCaC is about to churn out yet another futile tome. And how will its upcoming Fifth Assessment Report deal with the absence of global warming since a year after the Second Assessment report? Simple. The global-warming profiteers’ bible won’t mention it. There will be absolutely nothing about the embarrassing 16-year global-warming stasis in the thousands of pages of the new report. Zilch. Nada. Zip. Bupkis. Instead, the report will hilariously suggest that up to 1.4 Cº of the 0.6 Cº global warming observed in the past 60 years was manmade. No, that is not a typesetting error. The new official meme will be that if it had not been for all those naughty emissions of carbon dioxide and other greenhouse gases the world would have gotten up to 0.8 Cº cooler since the 1950s. Yeah, right. If you will believe that, as the Duke of Wellington used to say, you will believe anything. The smarter minds at the conference (all two of us) are beginning to ask what it was that the much-trumpeted “consensus” got wrong. The answer is that two-thirds of the warming predicted by the models is uneducated guesswork. The computer models assume that any warming causes further warming, by various “temperature feedbacks”. Trouble is, not one of the supposed feedbacks can be established reliably either by measurement or by theory. A growing body of scientists think feedbacks may even be net-negative, countervailing against the tiny direct warming from greenhouse gases rather than arbitrarily multiplying it by three to spin up a scare out of not a lot. IPeCaC’s official prediction in its First Assessment Report in 1990 was that the world would warm at a rate equivalent to 0.3 Cº/decade, or more than 0.6 Cº by now. But the real-world, measured outturn was 0.14 Cº/decade, and just 0.3 Cº in the quarter of a century since 1990: less than half of what the “consensus” had over-predicted. In 2008, the world’s “consensus” climate modelers wrote a paper saying ten years without global warming was to be expected (though their billion-dollar brains had somehow failed to predict it). They added that 15 years or more without global warming would establish a discrepancy between real-world observation and their X-boxes’ predictions. You will find their paper in NOAA’s State of the Climate Report for 2008. By the modelers’ own criterion, then, HAL has failed its most basic test – trying to predict how much global warming will happen. Yet Ms. Christina Figurehead, chief executive of the UN Framework Convention on Climate Change, says “centralization” of global governing power (in her hands, natch) is the solution. Solution to what? And what solution? Even if the world were to warm by 2.2 Cº this century (for IPeCaC will implicitly cut its central estimate from 2.8 Cº in the previous Assessment Report six years ago), it would be at least ten times cheaper and more cost-effective to adapt to warming’s consequences the day after tomorrow than to try to prevent it today. It is the do-nothing option that is scientifically sound and economically right. And nothing is precisely what 17 previous annual climate yatteramas have done. Zilch. Nada. Zip. Bupkis. This year’s 18th yadayadathon will be no different. Perhaps it will be the last. In future, Ms. Figurehead, practice what you preach, cut out the carbon footprint from all those travel miles, go virtual, and hold your climate chatternooga chit-chats on FaceTwit. It appears the fake data and the urgent need to discuss nothing is the reason for the conference. The appearance of concern and urgency is enough to merit calling a conference. I imagine to escape the boredom of their non-working enviroments is the greatest alure they have. Or is it the frequent flyer miles? What we must do to end this nonsense is to have some scientific body pick a group of non-climate scientists to do an objective study of all the climate CO2 information to judge whether any parts of it have scientific validity. If we picked credentialed scientists, one in each of the fields of physics, mathematics, astronomy, biology, chemistry, and geology, they would have the professional knowhow that is so lacking in politicians. We could pick them from different parts of the globe so that national politics would be a lessor factor. We would ask for their scientific opinion and analysis of climate research, including reasonable numerical predictions for the future. Certainly the commonly presented computations are scalar , and the Trenberth radiative accounting diagram ( which always reminds me of a diagram of the ionosphere from an old ARRL handbook ) appears to treat the earth as flat . That’s one reason I’ve been working to create a model in Array Programming Language which can simply model the sphere in as ( or more ) succinct notation ( but executable ) as any physics text . It doesn’t treat the world as flat; the figures are already adjusted for the shape of the Earth. we know the figures have been adjusted, but only to achieve the desired result. Well you say that, and yet everything we see happening around us suggests a rapidly warming climate. Just ask any biologist, for a start. There are literally tens of thousands of physical and biological metrics which reflect the ongoing global warming. Human-causation? And just how is THAT achieved? Also, did you bother to pay attention to the 16-year record of NO global warming referred to by Monckton? There has been no decline in the rate of global warming and there’s no plausible doubt that it’s caused by our massive emissions of greenhouse gases. Plausably, I doubt that you have any proof whatsoever that greenhouse gases are the cause of global warming but it is none the less a very popular theroy especially with politicians. That’s just it though, right? He refers to, he doesn’t cite a source. Such a pity that globally averaged mean surface temperature isn’t one of them, Eh ? Time you checked out CERN’s confirmation of the correlation of sunspot activity and cloud formation which was first postulated by an 18thC Astronomer Royal who noted zero sunspots equalled more rain(from more clouds) which in turn reduced temperatures which reduced the yield from wheat farming which drove up the price and generally reduced the quality of life for those fortunate enough to survive. Oh, did I mention none of the many and varied changes over recorded history have had but the barest impact from the level of atmospheric CO2 either? But solar flares and sun spots have been ignored in the calculations and can’t be because they are random and there is no way to predict them. They are outside mankind’s purview of control. Therefore, the whole idea of anthropogenic global warming is bogus! This year we had extraordinary solar flare and sun spot activity causing increased luminence and increased foliage in the plant kingdom and therefore less carbon dioxide and more oxygen and photosynthetic activity. What a balanced, ingenious and completely organized God to have all these systems so finely tuned and beyond our ability to decipher! . The global warming hoax is dying a slow death. I hope we have a grand funeral to celebrate! You did know that solar activity has been *declining* for several decades, didn’t you? Look up the sunspot series on the web somewhere – they’re not hard to find. Biologists have realized that the best way to get your paper published is to put some text in the narrative that indicates evidence of global warming. Sorry but that’s absurd. Global warming is unequivocal – no-one can dispute the fact that the climate is warming up, even if they dispute the cause. Biologists are naturally going to be writing papers describing the effect this is having on natural systems. Are you suggesting they should ignore it? Still everything is collapsed across geometry . I’m working to unfold that space in succinct executable well factored definitions in array programming language . And I have never seen a succinct computable definition of a “forcing” . I actually don’t understand how anything meaningful can be computed starting from an assumption that the surface of the planet is black . The neutral and computationally prior approximation is that it is gray , ie , has a flat spectrum . For our orbit that number is about 279k . Then you can start parametrizing the various components of the spectrum into surface versus atmosphere or the sum of particular surfaces and sprites . started with glenn.tamblyn getting a better approximation of the actual averaged surface spectrum of our planet . Explain how you arrived at this. The consensus exists because of the evidence. No. There is no evidence of human influence. Human activity –> elevated greenhouse gases –> global warming. There’s your evidence in a nutshell. All the rest is detail. Global Warming stopped, while CO2 continued to rise unabated. Therefore CO2, of which the human element is a tiny fraction, is demonstrably not the cause. In reality, global warming continues unabated. That’s why the cryosphere is in accelerating meltdown. Uh, . . . er, . . . the cryosphere has been in “accelerating meltdown” for 12,000 years now. Look up Holocene Thermal Maximum sometime. The world was on a long slow *cooling* trend for about 8,000 years until the start of the industrial revolution. Now it’s warming 100 times faster than it was previously cooling. Do you really think this is just a coincidence? You are just parroting Al Gore. Where is the evidence ? I just gave it. For the detail, consult the scientific literature. Is AL Gore a scientist I thought he invented the internet? I’ve looked in the scientific literature. The “detail” of which you speak cannot be found there. Is it possible you have mistaken the scientific literature for your imagination? I would suggest that you weren’t really trying. Right and the leaves of trees fan the atmosphere create wind that cools the planet. Isn’t that the same logic that would have us believe crop circles are/were created by space aliens? We know humans are generating hundreds of billions of tons of greenhouse gases, and we know greenhouse gases heat up the planet. Even the most ardent ‘skeptics’ accept this (just ask Lindzen, Spencer etc). The only legitimate debate is about the magnitude of natural feedbacks. There is no evidence of significant human influence on the Global Warming of the last century, which stopped. tw. 16 years ago, despite CO2 continuing to rise steadily since then. there are only the faed projections of flawed computer models and a dependency culture that has grown up around the whole notion of human influence. They do their studies and find these results not for science, but to keep the cash flowing into their IPCC-friendly labs. The fossil fuel industry make trillions of dollars in profits. If it’s all about money, who stands to gain the most – those trillionaires or the climate scientists who just earn an ordinary salary? The scientists salaries may be ordinary, but they certianly are beholden to whoever pays it none the less. The earth’s temperature and CO2 levels of millions of years past can be easily determined by reading the ice and mantle cores taken several miles beneath the surface. But let’s look at a more recent history of global warming: nautical maps circa 1100. These maps show that the Northwest Passages were easily passable by large ships. A few of the traveling routes even went over the northern part of Greenland and through Nares Strait – even in the winter. We know it’s been warmer in the past – the trouble is, according to the natural cycle we should still be cooling now, whereas we’re actually heating up the planet very rapidly. By mid-century we’re going to be back to global temperatures not seen for millions of years. This is bad news for a civilisation sustained by a predictable and stable climate for agriculture. Icarus, you are wrong according to the UK Met Office. It says in a recent press release: “The current period of reduced warming is not unprecedented and 15 year long periods are not unusual”. Now, I know that the phrase “reduced warming” is obfuscatory speech bu,t in reality, it means lack of warming. Now, lack of warming can mean either cooling or stasis. Take your pick, but one would need to be somewhat dim to see how “reduced warming” could possibly mean an increase in warming. Maybe you should be taking your analysis up with the Met Office or, alternatively, re-reading the authors you quote to see if they make sense in light of the last 16 years’ empirical observations. The ‘reduced warming’ they refer to is in the surface and lower troposphere temperature trends, which represent less than 3% of the heat content of the climate system as a whole – well over 90% of the heat content resides in the oceans, which are warming faster than ever. That’s why we keep getting new record minima of Arctic sea ice, as well as accelerating melting of the Greenland ice cap, the Antarctic ice cap, and mountain glaciers worldwide. There will always be short term wiggles in any temperature series but there is no sign of any reduction in the long term global warming trend. shows there’s been no warming for 16 years, Icarus. Well done. We’re starting to make progress. al 2012 (that you reference above) also accepts this empirical data (see the black line temp data at Fig 2 of the paper you quote). and seemingly fictional accounts that I’m loathe to waste my time with you any further. And finally, on the question of Arctic Sea Ice, NASA recently admitted that: “This year, a powerful cyclone formed off the coast of Alaska and moved on Aug. 5 to the center of the Arctic Ocean, where it churned the weakened ice cover for several days. The storm cut off a large section of sea ice north of the Chukchi Sea and pushed it south to warmer waters that made it melt entirely. It also broke vast extensions of ice into smaller pieces more likely to melt”. Now, if you’dlike me to get on to so-called ocean warming I will; but not today. Clearly global warming continues unabated – if there was any evidence to the contrary, why would you be studiously ignoring the accelerating loss of ice mass from Greenland, Antarctica and mountain glaciers worldwide, and their contribution to the acceleration of sea level rise? Why would you resort to the comical “Arctic ice is on its way back” ploy (yes, it’s winter in the northern hemisphere) if there wasn’t a very clear accelerating decline in that ice over the last 3 decades? That’s where global warming denial always falls over, you see: You would be better off just ignoring the inconvenient evidence and hoping no-one will pay any attention to it, but instead you demonstrate the vacuity of your claims by cherry-picking and misrepresenting data, by trying diversionary tactics and other forms of dishonesty. That’s a sure sign that there really isn’t any evidence to support the ‘skeptical’ position at all. OK Icarus, I think we can leave it there. You are talking too much nonsense I regret to say. However, you’ve nicely exposed your closed mind for all to enjoy. I am sure david screwzuki and the IPCC, with the personal financial backing of obama, steyer, soros, greenpiece, al gore and the rockefellers would be only too happy to finance such unbiased research. This would be their big chance to verify their theories and wild claims. I’ll not hold my breath. Lord Monckton is wrong. The question is why. Is it an error, a mistake, or is he enjoying the notoriety of being a contrarian or a paid fool of the Koch brothers. We can not keep stuffing carbon into the atmosphere and pretend there is no future cost to pay. Farmers life a US insurance company is forming a class action suit against the city of Chicago. The claim is that the government by ignoring climate change the city has built insufficient capacity for water drainage. I can see a judge crucifying Lord Monckton in court for being an idiot if he uses his present argument to deny climate change is man made. THE DENIERS, by Lawrence Solomon, reveals the bullying suffered by some real experts, and provides a better version of the truth than offered by the Cult of Anthropogenic Climate Alteration. For the uninitiated, this particular galah is a large rumbustious bird of sizeable stature, has a pure (naturally) snowy white plumage plus the eponymous crest, has an appallingly loud and jarring shriek, is a bane to farmers and other gentlefolk and has no commercial value as a food stuff or any other commodity including fertilzer. Other attributes include hanging round in violent gangs, terrorising other birds and denuding homes, houses and buildings of timber via an enormous beak and insatiable appetite. And some of the captured can actually learn to speak! A bit like most of the warmists I know or hear about really. Umm; actually the Galah is pink and grey with a white crest. They make very good tucker. Just boil them in a bucket with two medium sized stones. They are ready to consume when the stones go soft. The trick is to throw away the Galahs and eat the stones. Salt to taste is always best I find. When will the legal options be pursued to charge these miscreants with wholesale “conspiracies to defraud” the PEOPLE of this Global Community?……………or is it just enough to “expose” them for what they are …..”Climate Criminals”? I love reading Lord Monckton’s erudite observations of the stark naked emperors of doom. “Top o’ the Morn'” to you Sir!!! experiment that proves that the Greenhouse gas effect does not exist. You might as well try to disprove gravity. Gravity is but a distortion in the space time continuum, caused by matter. Time has already shown that CO2 doesn’t matter. But gravity really exists. The Greenhouse Effect is a sham. Please explain how an atmosphere radiating IR at a lower intensity (cooler) than Earth which is emitting IR at a higher intensity (warmer) can warm the Earth? Think of a runner going 20 mph trying to be pushed forward by a runner going 10 mph. Can’t happen. But both runners can fall off a cliff. IR stimulates the atomic/molecular “greenhouse gases” which, in turn, re-emit a PORTION of (temporarily) absorbed radiation back toward Earth. The atmosphere’s emitted IR is at a frequency determined by the cooler atmosphere and cannot be sufficient to further agitate (warm) the Earth. Put a pot of boiling water in a microwave and put the microwave on at a power too low to boil the water. Will the water continue to boil or will it cool down? A cooler body cannot warm a warmer body (2nd Law of Thermodynamics), even though both bodies give off “heat” in the form of radiant IR. The Earth is roughly in radiative equilibrium, to less than 1W/m², so the IR flux from the surface of ~395W/m² is balanced by solar irradiance of 240W/m² plus downwelling IR of ~155W/m². Evidently the downwelling IR must elevate the surface temperature, otherwise the surface would have to be at ~255K in order to be in equilibrium with incoming solar energy. Rubbish. the surface temperature remains elevated because of the adiabatic lapse rate, which is slowed by such things as clouds in the atmosphere. it is not possible for cooler CO2 molecules to warm an already warmer body. The lapse rate simply describes the temperature profile of the atmosphere – it doesn’t cause anything, it’s a consequence of the greenhouse effect. Of course downwelling IR imparts energy from the atmosphere to the surface – it can’t *not* do so. That much is undisputed. If the surface was only warmed by solar irradiance it would have an average temperature of 255K, all other things being equal. This argument about a cooler body not warming a warmer body is a nonsense – the surface receives that 155W/m² from the atmosphere and is warmed by it. Only in a closed system would this argument about the SLoT be relevant, and of course the climate is not closed. Australia that killed 10,000 or more lambs, (effect on food supply). reduced food supplies. We’ll be looking for “global warming”. years an indicator of this coming “mini-iceage”? fuels which will be needed to keep us alive in the long winters. Jackson head of EPA should be charged with manslaughter. Any fool can feel gravity. Not possible to disprove it. Greenhouse gas effect is not tangible. Gravity could possibly be disproven in the same way global warming has been proven. 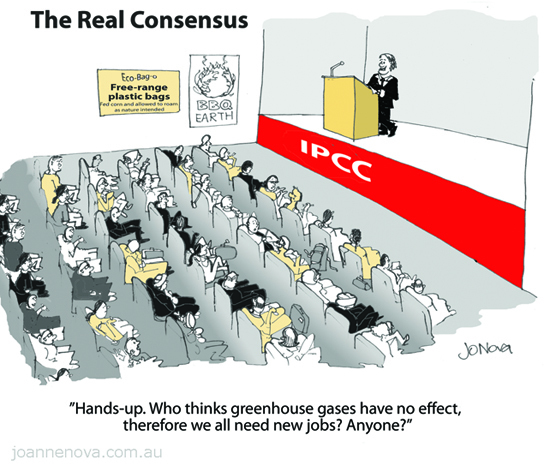 It would take alot of politicians and grant money for scientists to get a consensus. Then they could publish a paper and we could all travel to the moon for free. Gravity, or the cause thereof, is concisely defined, and therefore testable. Greenhouse gas forcing is not concisely defined. Thus greenhouse gas forcing is untestable and, therefore, not valid science. On the contrary, it’s crystal clear – a greenhouse gas forcing is a change in the magnitude of the greenhouse effect caused by a greenhouse gas… and the greenhouse effect is the difference between the effective radiating temperature of the Earth (~255K) and the mean surface temperature (~288K). What’s not clear about that? This year . . . 2012 . . . the luminence of the sun was particularly striking and noticeable compared with previous years. (Would have been a bad year for exposure and possible skin cancer.) How this can be ignored by the IPCC shows that their conclusions regarding the human impact on global warming are totally out of synch with the facts and they are living in their own delusions that man can affect climate change by reducing his “carbon footprint.” Sounds very nice and all too scientific, and why wouldn’t any good person want to promote health and reduce emissions? But it is squarely wrong! The significance of this points up the fact that whatever we do, humans have absolutely no impact on the sun, it’s solar flares, sun spots or nuclear activity. Zilch. Nada. Zip. Bupkis. Thank you, Lord Monckton, for your continuing effort to set the record straight and help sane minds to prevail on this issue which the left has adopted based on selfish human outcomes rather than sound science.. In reality of course, global warming is proceeding faster than ever. dont confuse melting with warming. Melting may arise from previous warming, which stopped 16 years ago. If the IPCC isnt predicting cooling, then I’d invest in furs (fake ones of course) now. Global ocean heat content rose faster in the last decade than in the previous two – about 10^23 joules. That’s a lot. What absolute rubbish. it’s been flat since 2004. Somewhat bizarre chart as it supposedly comes from a study in 2009 but shows data to 2011. Also it only covers the top 700m of the oceans. The data to 2km is what I was referring to, from Levitus et al 2012, which shows the Earth gaining heat equivalent to 430,000 Hiroshima nuclear explosions every single day. Causation? Hot sun. Not human emissions of CO2. Equating relatively trace human emissions of a trace gas to ocean warming is not possible. Don’t even try it. This is what happens when the term “global warming” is abused to mean “human-caused-global-warming” … particularly when there is no credible science that demonstrates human activity can impact global climate change. Any solar physicist will tell you that solar irradiance has been declining for decades. We have satellites measuring it 24/7. Solar irradiance and global temperature have been going in opposite directions, so it’s clearly not the sun causing global warming. Clouds caused by coronal ejections cause warming, rather than by radiation. otherwise all you’re saying is there is an imbalance we cannt explain so humans must have caused it. don’t be so hard on yourself. The greenhouse effect has been known about for 200 years – it’s very well understood. Clearly an increase in the greenhouse effect would be expected to cause warming, all other things being equal, and that’s what we see. A steady increase in CO2 over the last 16 years hasnt resulted in any warming, so the increasing greenhouse is having no effect. Zilch, nadda, bupkis. A claim contradicted by continuing global sea level rise amongst many other facts. Heat moves. measuring temperature in depth bands of the oceans is an extremely poor indicator of ocean heat content. The average ocean depth is more than twice that (2km). It’s not ‘extremely poor’, although of course it could be better. The rapidly rising sea level and melting ice all over the planet kind of confirms the conclusion that the Earth is out of radiative equilibrium by a substantial amount. Could we have that in megatons please? Only .74 degrees celsius TOTAL according to NOAA without warming for 15-16 years according the the Met Office. How’s that for reality? That is the transient warming. Even from today’s forcing we can expect around 1.3C from fast feedbacks and double that from slow feedbacks at equilibrium… and no-one thinks our greenhouse gas emissions are going to stop any time soon. The Arctic has lost over 80% of its summer sea ice in the last 30 years. Greenland and Antarctica are losing mass at an accelerating rate. Sea level rise continues unabated. Global warming continues unabated. We’re seeing shifting climate zones, changing weather patterns, an order of magnitude increase in extreme weather, increases in intense precipitation… It’s not looking good and that’s only with the .7C or so that you cite. We don’t really want to see what 2C or 4C or 6C looks like. Good because its too cool already we could use a little warmth. Thankyou for another hughely entertaining account. With less & less to go on each year it must be difficult, but Christopher never fails to produce new and interesting perspectives on this desperate situation. If only 2 out of the 18 COPs coincided with Warming, it rather suggests the UN is no way to deal with any urgent problem and what have they been doing for the last 16 COPs? hindsight is a wonderful thing, but isn’t it perhaps about time for the UNFCCC to admit, it’s a fair COP guv. and shut up shop ? If IPeCaC remains uninvite, to this Conference, is it IPeCaC or the UNFCCC Conference that is no longer relevant ? Would someone show this data and chart to MSNBC? I’m sure they’ll want to spread the relief far and wide, and often. And be sure to let Mr. Obama know, before he gets his cap and tax train back into high gear. Jesus, take a basic writing class. Who are you, a third former? It’s actually painful to read. You’re not doing your positions any favours by phrasing your essays as something between teenage girl diary and fruitcake study notes. Your Wikipedia entry says that you used to be a newspaper editor, but I have literally never come across a grown person with worse language skills than yours. You can disagree with Lord Monckton’s conclusions (though is research is thorough) , but his mastery of language is exceptional and generally agreed to on all sides (to the chagrin of his opponents). We’ll have to agree to disagree on that then. I have since looked up *what* papers Lord Monckton’s has been an editor of, and have started to see the problem. I know people who have worked at similar papers in other countries early in their journalistic careers, and have stated that these are positions you need to sweep under the rug a little on your C.V., if you ever hope to land a position at a reputable publication. And no, the research is not thorough. You’re right that I disagree with him, but I decided to not go into that in my reply. There’s enough of that going around already, it is sufficiently discussed elsewhere. Mind sharing the ‘problem’? Judging by the way you write I doubt you’ve looked up anything. Recent re-evaluation of melting ice and sea-level rise in Nature and Science. See my analysis on theresilientearth.com. The Honorable Lord is quite right when he states for 2012 you can’t blame hurricane Sandy, the Midwestern drought, and the Eastern Heat Wave in the United States on global warming when there has been no global warming for 16 years. However, distorting truth has never been a problem with climate alarmists and they have made this claim. Naturally, the media being our large newspapers like the Washington Post, New York Times, etc, and television networks ABC, CBS, NBC, CNN, and MSNBC have peddled this misinformation without the slightest appearance of doubt. Now alarmist organizations are quoting polls stating 70 percent of the U. S. population believes global warming caused these events and wants our government to do something about it. Possibly the govenment may do something and only magnify the economic malaise of the past four years due to policies to curtail fossil fuel use and replace it with impractical, unreliable, and uneconomical renewable energy sources. What one needs to come to the conclusion that AGW doesn’t exist is a degree of honor,integrity and at least two functioning brain cells. All those bloviating about AGW clearly are riding the gravy train for personal profit. There can be no other explanation for this amount of corruption and deceit. I believe man is causing the temperature to rise. I believe this because I am told by the United Nations and they are the most honest non-political organization created. The solution the United Nation proposes i.e to hand over national sovereignty to the UN and centralize all industry, is the best option available. Anyone else who’s read the Communist Manifesto will agree. i have been looking at both sides of this, one thing I find a bit alarming about CFACT is a pdf file debunking global warming and man made climate change. It contains 100s of links, but every one is back to CFACT articles, nothing out side of CFACT, yet they claim these are independent articles. they all seem dependent upon CFACT. This is bothersome to me.